I first heard this claim on a show that the late Bob Chapman was a regular guest on, and heard Alex Jones repeat it on June 7, 2012, in a reflection on Bob Chapman’s life. The part about “the Feds” planting hand grenades in his house is pure fantasy, and should be treated as such, until extraordinary evidence is provided for such an extraordinary claim. This is an example of what I find to be the lack of critical analysis among the vast majority of those in the so-called alternative media. That the government would try to intimidate or kill Bob Chapman using such a literally explosive means strains credulity, in drawing so much unnecessary attention when there are far more subtle ways of killing someone, especially if you have the means of government at your disposal. 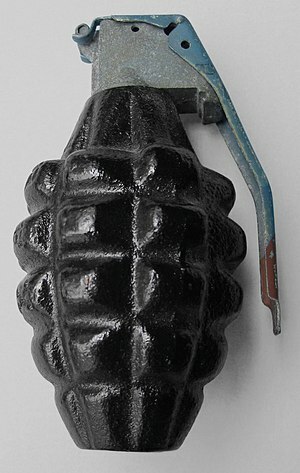 Even if hand grenades were planted there to intimidate him — without going off — where is the police report or local media reports of such an incident? It should’ve generated a lot of attention, given the danger it would have placed nearby residents in. Hand grenades aren’t something you take into your own hands and dump in a nearby trash bin. The police have to be phoned, and the bomb squad has to be brought in. That would draw a lot of attention, even before the days of the World Wide Web. I could believe that devices made to look like hand grenades were placed in his house, but there would be no way of knowing for sure until they are professionally identified, and it would be putting other people’s lives at risk to make that determination on your own. Another variation of this story is that they tried planting hand grenades in his home. Well, saying you’ll try something isn’t anywhere close to actually doing it. We learned in March 2012 that Osama bin Laden — despite being killed for the ninth time — planned on killing Obama, but regardless of whether he was still alive to do it, he clearly didn’t do it, and such intentions were rendered of no effect. Actually I heard Bob himself on one of his interviews talk about this and how he foiled the setup. You could have asked him yourself before making unfounded allegations but now its to late, (how convenient for you). Him saying it doesn’t make it any less unlikely. Thank you for confirming the accuracy of my article’s title. That they did not plant hand grenades in his home — allegedly only an attempt, which was as successful as Osama’s alleged plans to kill Obama. Now that he’s dead, I’m sure he’s aware of the fact that The Lord died on a giant balance(T) to show that creating an accounting tool($) to make sure we all get what we “deserve” would mean a world ruled by eugenicist geo-engineering tyrants. He was one that helped me figure it out the times I was able to talk to him on the talk shows(though we both didn’t know it at the time). I envy you now Bob. I hope to see you soon in eternity. And thanks to you and Anthony among others for helping me figure it out, though you may not believe it. Now all I ask is what is my purpose here Lord? So, in other words you DO NOT have all of the facts, are resorting to conjecture. Thank you for confirming that you are one of those who believes the tale without any neutral, third-party confirmatory evidence, whatsoever.